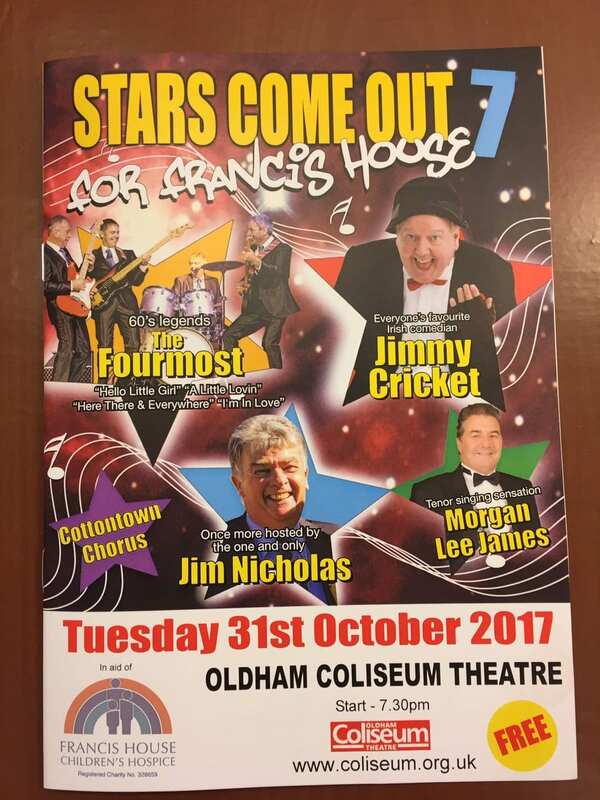 The 2017 version of the Stars come out for Francis House show was held on Halloween at the Coliseum Theatre in Oldham. It was the seventh time the event has been organised to raise funds for the Francis House Children’s Hospice in south Manchester. Famous Northern Irish entertainer Jimmy Cricket was joined by The Fourmost (below), an English Merseybeat band who recorded in the 1960s and whose biggest UK hit single was A Little Loving in 1964. Singer Morgan Lee James also performed, while Jimmy’s good friend Jim Nicholas was again the host for the evening. A sum of about £9,000 was raised from the latest edition of a charity show Jimmy Cricket routinely appears in at the Coliseum Theatre in Oldham. 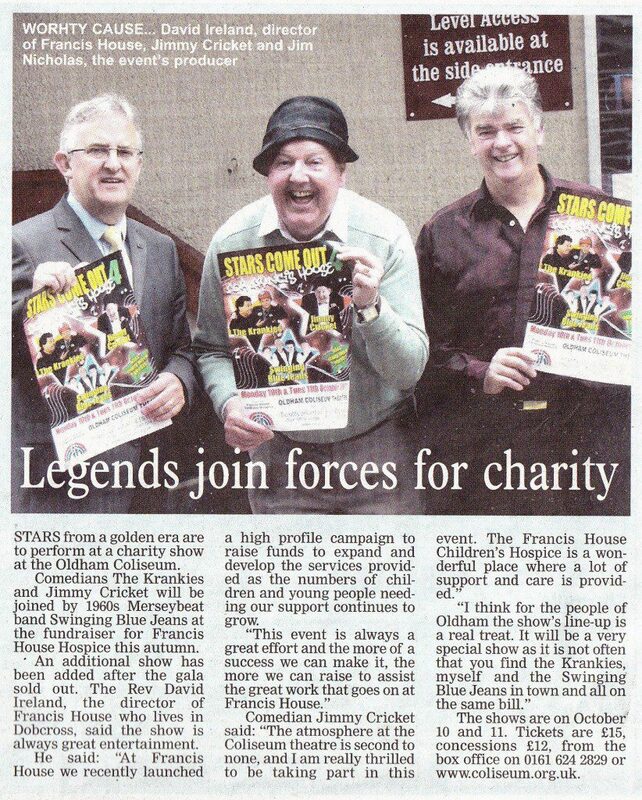 The 2016 version of the Stars come out for Francis House show was held at the end of March. It was the sixth occasion the concert has been organised to raise funds for the Francis House Children’s Hospice in south Manchester. In addition to famous entertainer Jimmy, the show featured his friend Jim Nicholas, who not only acted as the show’s host but also co-produced it. 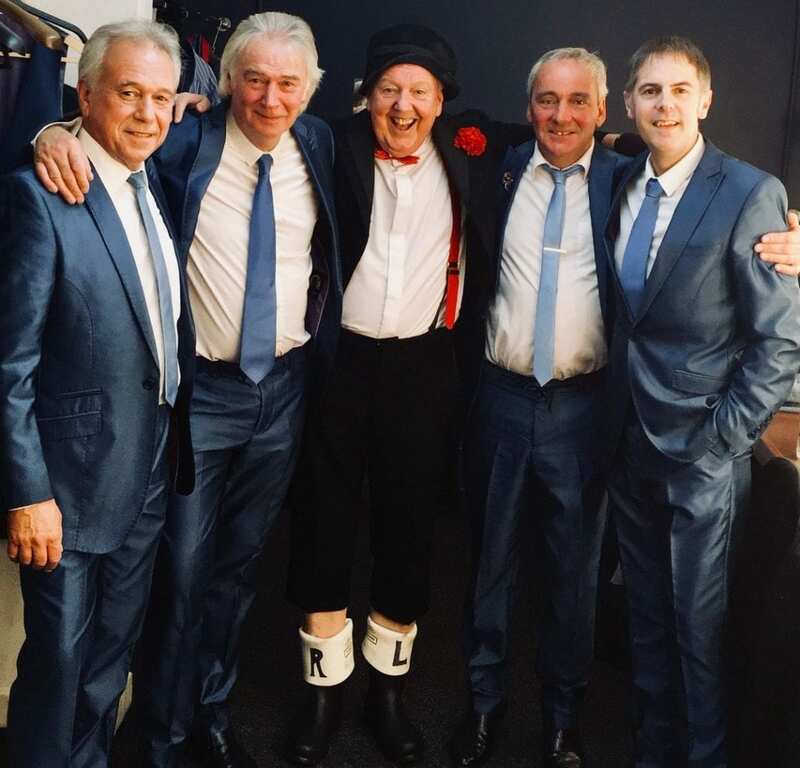 The two Jims were joined on stage by Frank Sinatra tribute act Jonathan Swift (right), the professional whistler David Morris, the vocal duo Kamika, and 60s legends the Merseybeats, who headlined the show. A packed auditorium helped to raise the most money in six editions of the show for Francis House. Chief executive of the charity, David Ireland, thanked everyone who had come along to support the event. The seventh show is already being planned, again at the Coliseum Theatre, for October 2017. 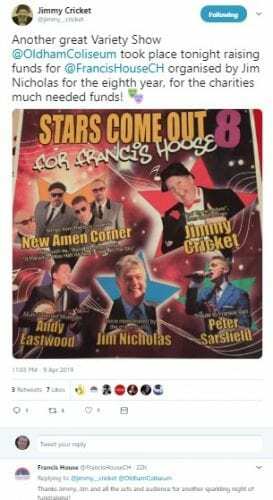 PLEASE NOTE – A REPRISE OF THIS SHOW WILL BE HOSTED BY THE BRINDLEY THEATRE IN RUNCORN ON SUNDAY 19TH JUNE AS JIMMY WILL ONCE MORE TEAM UP WITH THE MERSEYBEATS FOR AN AFTERNNON OF ROCKING WITH LAUGHTER!!!! 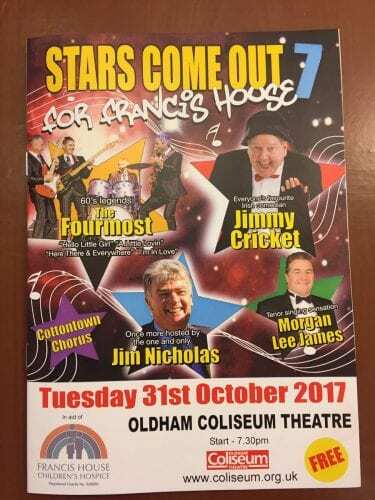 Tickets are selling fast for the latest edition of the Stars come out for Francis House show scheduled for later this year at the Oldham Coliseum. This is the sixth occasion the fundraiser will be hosted by the theatre and all previous editions have been incredibly well attended, ensuring thousands of pounds have been raised for Manchester’s hospice devoted to children. Over the years the show has featured performers such as the Krankies, actress Catherine Tyldesley, the late Norman Collier, the Grumbleweeds, the Ivy League and other renowned artists. This year’s edition is scheduled for Thursday 31 March and appearing alongside legendary 60s band The Merseybeats will be the much-loved and locally based comedian Jimmy Cricket. Completing the line-up will be the duo Kimika and the singer Jonathan Swift. Co-producer Dale Mulgrew said: “We are thrilled the interest in this show continues to grow, ensuring most of the tickets for our next one in March have already been sold. “A lot of this is down to those who have been to one of our previous shows and who have really had a great time and so often we get asked when the next one is. 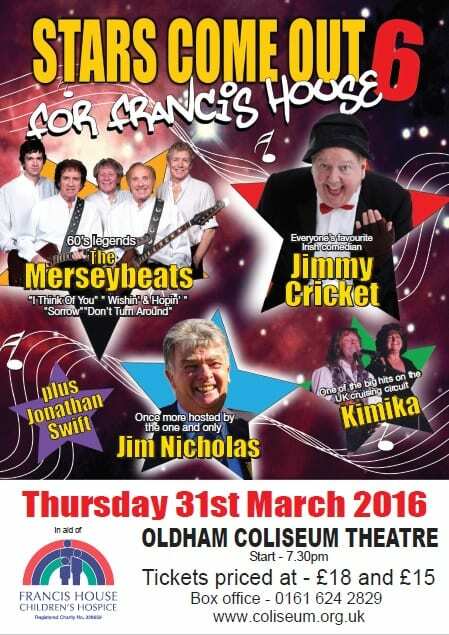 Jimmy Cricket will be back at the Oldham Coliseum Theatre next year to help raise more money for charity. 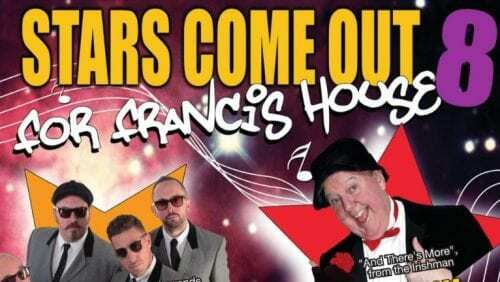 Due to popular demand, an annual fundraiser in aid of the Francis House Children’s Hospice will once more provide a dazzling array of entertainment for one night only. Stars Come Out For Francis House 6 on 31 March will again feature the iconic 60s band The Merseybeats, who will rekindle past memories through their hits I Think Of You, Wishin’ & Hopin’, Sorrow and Don’t Turn Around. Alongside them will be local favourite and famous comedian Jimmy, who continues a long association with the show and will provide a welcome dose of his much-famed daft humour. Sinatra impersonator Jonathan Swift will drop by to offer a bit of crooning. The show will be hosted again by compere Jim Nicholas. splendid show you won’t find anywhere on television, while raising plenty of money for a very worthy cause. The organisers of a charity event at the Coliseum in Oldham earlier this year returned to say thank-you to the theatre for hosting the show which was a huge success. 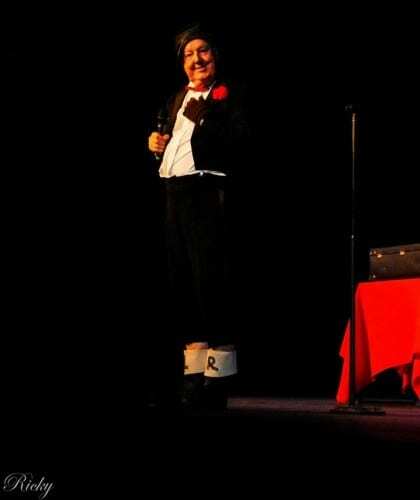 Jimmy Cricket helped to raise more than £6,000 for a Manchester-based charity at the two-night extravaganza in October. The famous Irish comedian appeared in the “Stars Come Out”, along with husband and wife comedy duo The Krankies and sixties Merseybeat band The Swinging Blue Jeans, of “You’re no Good” and the “Hippy Hippy Shake” fame. The show also featured the Dobcross Youth Band. An extra night was added after the originally-planned one-day performance was sold out. 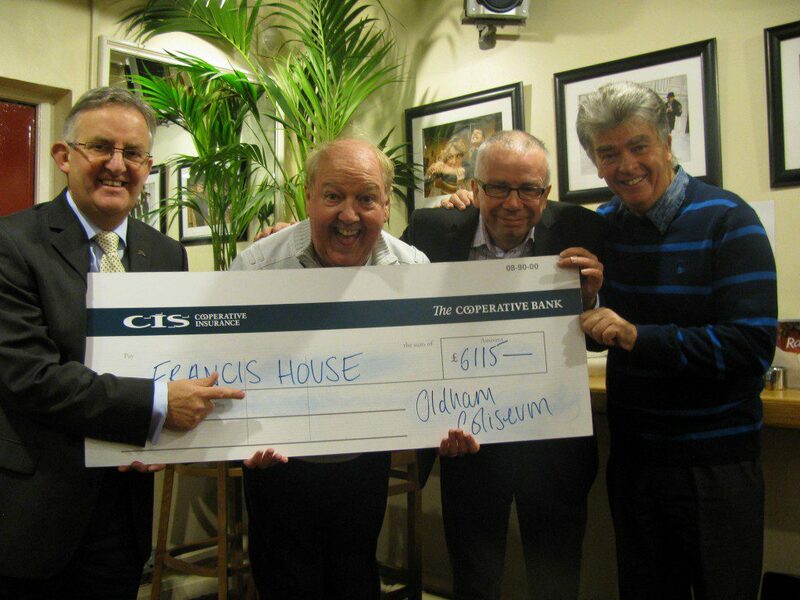 The money from the shows went to Francis House Children’s Hospice, which is based at Didsbury in Manchester. The Hospice cares for children and young adults with life-threatening conditions and provides a home from home where families can receive professional care, support and friendship. 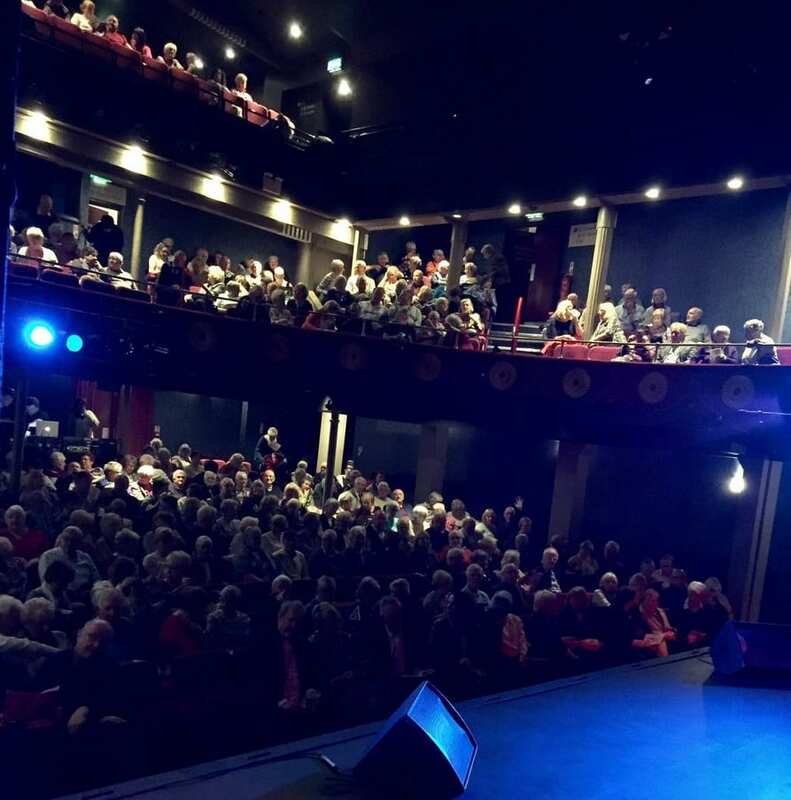 The charity’s director, David Ireland, also participated in the recent thank-you visit, along with Jimmy Cricket who said: “The show was a resounding success and raised buckets-full of cash for the charity. 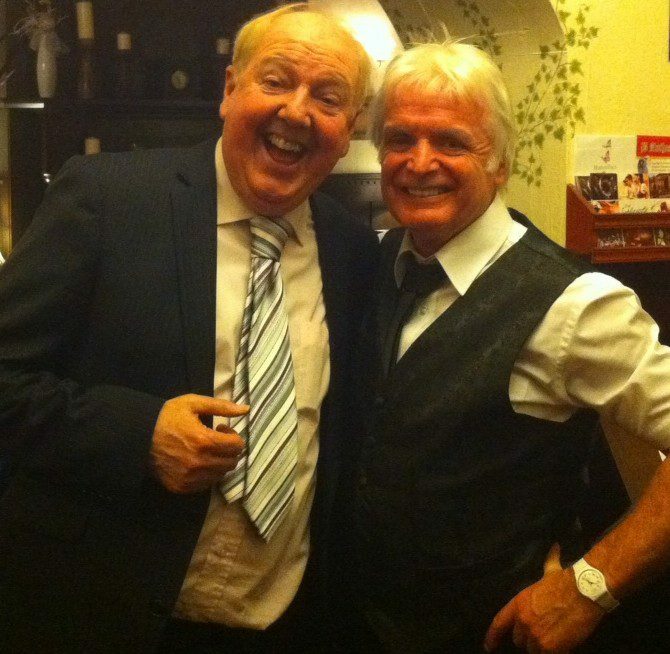 Jimmy Cricket visited the the Old Bell Inn in Delph, Saddleworth, after an invitation from the Director of the Francis House Children’s Hospice, David Ireland. The occasion was a “thank-you” meal for the comedian’s efforts in a recent fundraiser for the Hospice, organised at the Coliseum Theatre in Oldham in October. The show also featured the Krankies and the Swinging Blue Jeans. The total raised from the show was in the region of £6,000 for the charity. One of the sponsors of the show was the Old Bell Inn which generously supplied a number of bedrooms for the visiting band members of the Swinging Blue Jeans as part of their sponsorship. Jimmy spoke to the Swinging Blue Jeans after their stay at the inn and they said they were very impressed with the hospitality provided. 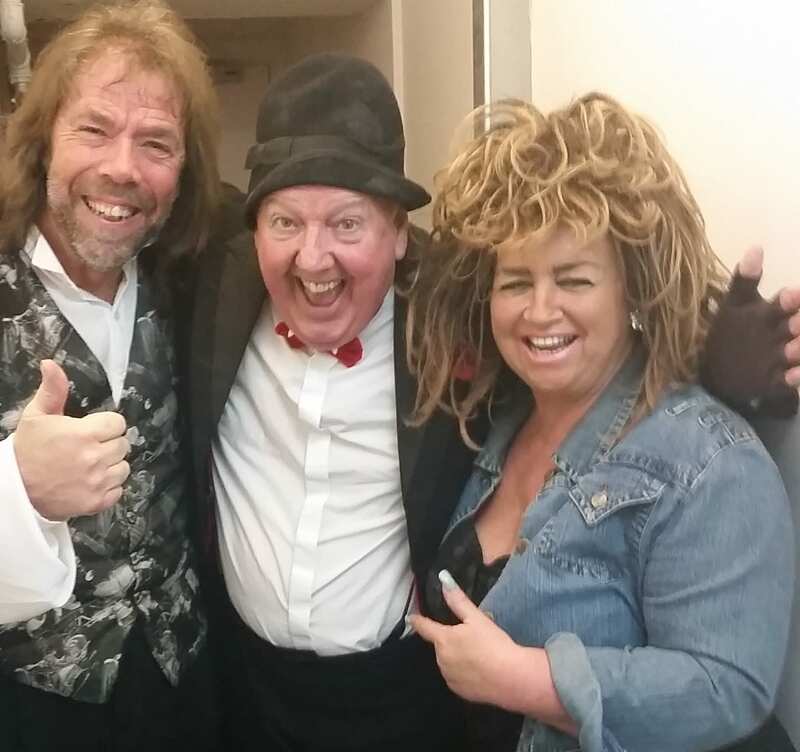 Phil and some friends attended the second performance of the show at the Oldham Coliseum and afterwards he mentioned that he had thoroughly enjoyed himself. He is a great supporter of Francis House and recently hosted a wine-tasting evening at the Old Bell Inn to also raise money for the charity. Jimmy said he enjoyed his meal at the Old Bell Inn and readily recommends the restaurant to anyone passing through the Saddleworth area.